Hey there hunters! 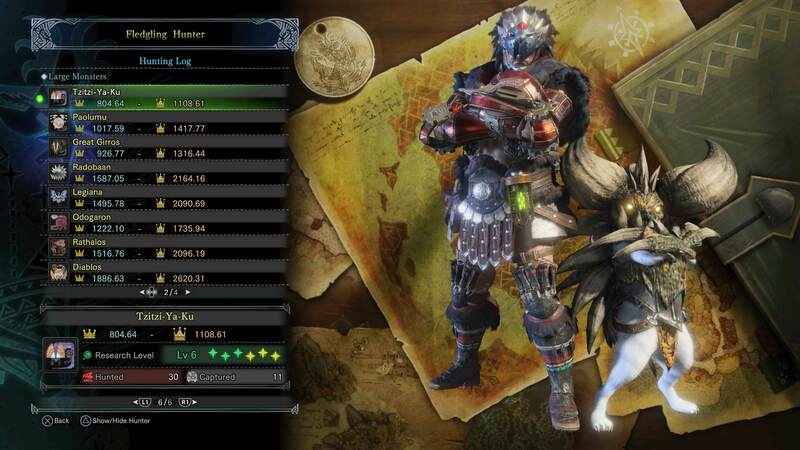 I recently completed the large and small gold crowns for each monster in Monster Hunter World and I would like to share a few sniping tips that helped me shaved hundreds of hours. This is a google sheet of all the quest I did to get the gold crowns. For quest which are not there, it is because I got the crowns before I started compiling this list and I can’t remember quest parameters. I believe investigation quests with the EXACT same parameters will give the exact same monster size. However this is yet to be confirmed. “Attempt” means the number of tries I did for that specific investigation. For example some investigation can be done 5 times and attempt 3 means my 3rd run for that specific investigation. I crafted 1000 shock traps for monster sniping alone. What I do is enter the quest, shock trap the monster, and immediately stand beside its leg. From there I can differentiate how tall is the monster compared to my head. Lets take Lavasioth for example. Lavasioth has a bright orange spot on its left leg. I will place the shock trap below it and immediately run to its left leg. If the bright spot is above my head, it’s probably gold largest. If it’s below my head, it’s probably gold smallest. If its’s the same height as my head, I’m leaving the quest. At the beginning it would be hard to determine the average but after a few kills, you will get the idea what is big and what is small. Using this method, I had to enter about 30 Lavasioth quest and it took me about 10 Lavasioth kills to obtain both smallest and largest gold crown. See how much time is saved? I don’t have to kill all 30. I just have to kill the ones which are big and small. Once you have mastered using the shock trap and finding the average size, remember that the size of a gold crown monster is 25% bigger or small. It is VERY noticeable when you are standing beside it. This might sound hard right? Since they will be moving around a lot? The fact is elder dragons sits down a lot. Kushala and Teostra will sit down for about 30 seconds and will not attack you even if you do not have ghillie mantle! That is more than enough time to stand beside it and compare size. Nergigante will sit down for a while before it shed its spikes on the ground. Kirin walks non stop but I found it easy because it has a purple tattoo on its leg. I will walk alongside it and compare the tattoo to my head. Vaal Hazak walks very slowly and stop after a few steps. Use this to your advantage. That’s right! Ghillie mantle is really important during sniping. You wouldn’t want a monster to be charging or roaring at you when you are trying to place a trap right underneath it. It saves a lot of time. As seen in my google sheet file above, ALL the gold crowns I got (except from event quest) are from investigation quests which gives at least 1 silver and 1 gold reward item. I believe quest with at least 1 silver and 1 gold has a high chance of spawning gold crown monsters. These quest have 3 or 5 tries. So save your time and delete all the quest without silver and gold reward. Remember to ONLY DO INVESTIGATIONS. After killing a monster, it will already be recorded into your game file unless you abandon the quest. For quests which has already passed the 10 minute mark, you will not get the item reward. However if the monster is not dead yet, you can still join the quest so that when it is killed, you will get the gold crown. I sniped with a friend and our method is to each enter separate investigation to determine the monster size. If either of us found a gold crown monster, we would call the other one to join and kill. If you could find a partner to snipe with, you could reduce your sniping time by 50%. Imagine if you had 4 friends? You will be able to snipe really quickly. I upgraded my PS4 pro hard disk into a 500GB SSD and the loading time is insanely fast. Monster sniping requires you to enter and leave hundreds of quest. Cutting down the loading time by 30% reduces your sniping time tremendously too. 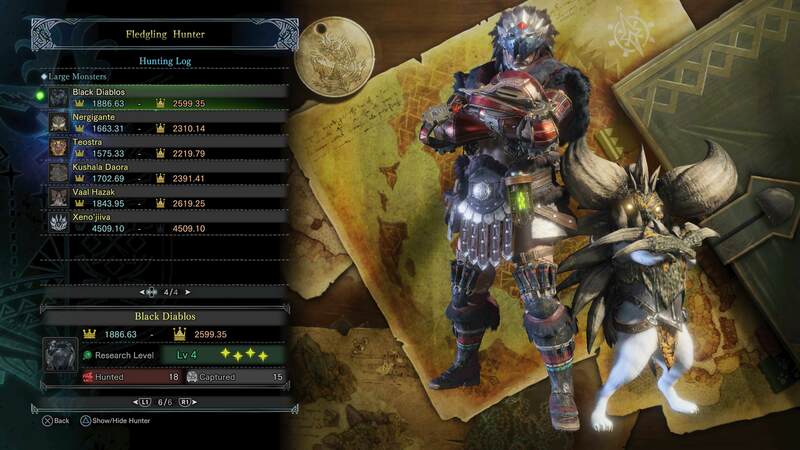 Please don’t forget that Capcom is releasing an event quest every week which has a very very very high chance for gold crowns. It requires you to fight 5 monsters in a map. Last week is Ancient Forest and this week is Wildspire Waste. Next week is Coral Highlands and there is still no schedule for Elders Recess and elder dragons. As such if you would like to start sniping, you can start with Elders Recess and elder dragons. These are some of the tips I can think of right now and I will add more in the future. Once again, check the investigations you have with the ones I have listed in my Google sheet. If they have the exact same parameters, you should get gold crown from it. It took me less than 100 hours of sniping to get all the gold crowns. It is still RNG based but this is the fastest method to obtain them all.